Panniculitis is a skin disorder that may present as tiny painful bumps protruding the skin surface of the legs and other parts of the body. It has many types, all which have their own distinct physiological forms, depending on the inflamed location within the skin cell. But, what is panniculitis? It is the inflammation of fatty tissue, and the medical term refers to a class of skin disorders that affects the fatty tissue layer located just under the skin’s surface. This skin layer regulates core body temperature as it is a source of insulation. With panniculus, the layer of fibrous tissue becomes inflamed and swollen. As a result, it presents small nodules of thickened skin that appears red or darker than the normal skin surface. Inflammation of these skin cells may also become painful, and treatment depends on the cause of the panniculitis. It may be caused by an existing connective tissue disorder, inflammatory disease, or infection, whether known or unknown. This condition may also be an effect of some medications. What Does Panniculitis Look Like? What Is Idiopathic Nodular Panniculitis? Panniculitis presents as nodules or raised bumps on the surface of the skin as the underlying tissue cells become inflamed. These nodules may also secrete an oily substance, which may indicate a more severe stage of panniculitis. If deep layers of tissue become involved, the bumps may be excruciatingly painful as the skin cells begin to corrode and die. This is referred to as necrotizing panniculitis, and it is detected by the formation of multi-layered lesions of the skin. This inflammation of the subcutaneous tissue is commonly seen on the legs, inner thighs, or buttocks. It can occur anywhere on the body when pressure is applied to the skin, as in the case with vigorous exercise or where skin can be easily injured. The subcutaneous nodules can be a result of minor skin afflictions such as intravenous injection entry sites or freezing of the skin in cryosurgery. The causes of panniculitis vary and can include infections, tissue disorders, inflammatory diseases, and even some medications. But in some cases, the cause may be undeterminable. This is the most common cause of inflammation of fatty tissue. An infection of the skin cells can be triggered by microorganisms such as fungi, bacteria, parasites, or a virus. Trauma to the skin surface such as needle injections or injury from an accident can cause the skin cells to become inflamed and result in panniculitis. This condition may also occur with the rubbing of skin during an exercise workout. Any health condition that involves inflamed cells like fat inflammation may lead to panniculitis, such as ulcerative colitis or Crohn’s disease. The fatty tissue can be on the protective layer of organs or under the skin surface. Pancreatitis and pancreatic cancer may also lead to panniculitis with the inflammation of the pancreas cells. But pancreatic panniculitis is rare. The redness and swelling of fat tissue may be the result of a rare inflammatory disease known as sarcoidosis. This gathering of inflamed cells may occur due to the immune system’s response to inhalation of an airborne substance. The sulphonamides class of antibiotics or oral contraceptives may cause the fat cells to become inflamed and lead to panniculitis. Extreme cold temperatures can severely damage the skin’s surface, as well as underlying tissue layers. Exposed areas to coldness may result in bumpy inflamed cells known as cold panniculitis. The raised red bumps of panniculitis may be caused by cancerous blood cells. Malignant blood cells within the lymph nodes and other tissue cells that become inflamed is a condition referred to as lymphoma. Leukemia, on the other hand, is known as white blood cell cancer within the bone marrow and blood. Panniculitis may occur due to a rare genetic disorder known as alpha 1 deficiency. The liver produces the alpha 1 antitrypsin protein that is essential for lung protection. Inflammation of cells can distort the shape of this protein, hindering its transportation to the lungs from the liver. Liver diseases and lung diseases can also be linked to this deficiency. Panniculitis has four main types, each having its own various classifications of the condition. Based on the individual characteristics, a type of panniculitis may involve the presence of inflammation of the blood vessels known as vasculitis, as well as the inflammation of the cells themselves. The separation of the classes focuses on two levels of inflammation. Lobular panniculitis is the inflammation of the fat cells, whereas septal panniculitis refers to the inflammation of the connective tissue that surrounds the fat cells. Most cases involve both lobular and septal traits. There are four major panniculitis types—lobular panniculitis with vasculitis, lobular panniculitis without vasculitis, septal panniculitis with vasculitis, and septal panniculitis without vasculitis. This occurs with the inflammation of the blood vessels primarily located in the lower legs. The small and painful nodules usually develop into lesions or ulcers. It could cause scarring in fat cells of the connective tissue as the cells waste away, and is associated with tuberculosis. 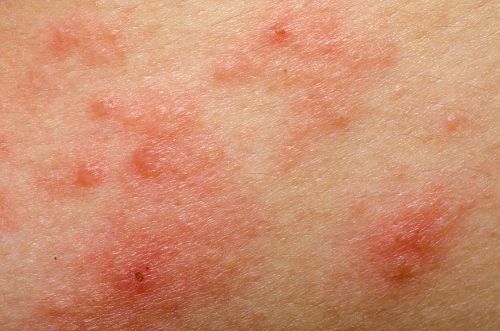 Once thought to be the nodular vasculitis, erythema induratum is now referred to as Bazin’s disease, and it is characterized by raised red bumps near the calves. This condition is not associated with just a single pathogen, and it applies only to the tuberculosis form. This is where an injury or trauma to the skin’s fatty tissue layer leads to panniculitis. Fat cells may suffer damage from extremely cold temperatures and become inflamed. This condition is seen mostly in children. When the pancreas becomes inflamed due to disease or primarily malignant cells, this rare condition may occur. An uncommon form of gout, gouty panniculitis presents as uric acid crystals form in the fatty cells. It may be linked to hyperuricemia, which is an excessive amount of uric acid in the blood. This is a rare form of the condition where the white blood cells of the bone marrow, known as histiocytes, attack the inflamed fat cells. The condition results in the collapsing of the cells. The rare disorder known as sarcoidosis occurs when the inflamed cells—caused by the immune system in its fight against an invader—do not return to their normal state once the infection is gone. Subcutaneous sarcoidosis occurs in the tissue cells under the skin. This is when inflammation of the superficial vein (near the skin’s surface) occurs and could result in a blood clot(s). It is more commonly seen in women than men. Leukocytoclastic vasculitis occurs when the blood vessels of the skin become inflamed and could destroy white blood cells. Leukocytoclastic involves fragments of the immune cells found in the walls of the blood vessels. Of all the various forms of panniculitis, this is one of the more common cases. The red nodules develop in the fat cells of the shin region, just under the skin surface. Erythema nodosum usually occurs in both shins. Ranging in size and shape from circles to lines, rheumatoid nodules are small, hard bumps within the connective tissue near the joints. These are commonly seen near the skin surface of those who suffer from rheumatoid arthritis. Also referred to as Weber-Christian disease, idiopathic nodular panniculitis involves various rare skin conditions affecting the fat cells of the skin’s subcutaneous layer. The inflamed cells appear alone or as a collection of painful nodules, usually less than one inch in size. These bumps may be accompanied by fever, muscle and abdominal pain, and an overwhelming feeling of not being well. The bumps and symptoms may last for up to three weeks, and this condition has been known to reoccur over a period of months and years. As the name implies, there is no known cause for any idiopathic condition. This form may lead to lesions, ulcers, and possible bleeding. Also, the tissue may develop scars. With panniculitis, the characteristic small, red or dark-colored bumps may be accompanied by symptoms of a possible underlying condition. These bumps may be hard and have a rough feeling to the touch. The nodules lay close to the skin surface and may be present as a single lump or in clusters. They may develop into lesions, which may expand deeper into the tissue. Tenderness and pain may be felt as nodules form on various body parts such as the buttocks, stomach, chest, legs, thighs, forearms, or even the face. If they break open, an oily substance may ooze, which can range from dark yellow to red with a tinge of blood. Other symptoms of panniculitis to watch for include nausea, vomiting, fever, and joint pain. Fatigue may also set in as a result of the pain of the nodules. Moreover, unexpected and unexplained weight loss may occur as organ tissues may be affected. For a proper panniculitis diagnosis, your doctor will look at your medical history and do a physical examination of the nodules. He or she will also ask about the development and pain level of the bumps. A skin biopsy is usually conducted to check for any cell and tissue death. And a diagnostic test known as a histopathology can detect heavily afflicted cells using a microscopic examination. Some cases may require a biopsy with the use of ultrasound equipment along with images of x-rays to gain a better view of the internal issue at hand. This may include a computerized tomography (CT) scan. For the treatment of panniculitis, natural remedies may be combined with lifestyle changes, and the use of medications. In severe cases, surgery may be required to remove the nodules and lesions. Rest is a common natural treatment for many ailments and disorders. And, it can also help in the case of panniculitis. During a needed break from activity, simply elevate the leg or other affected body parts. Also, be sure to use compression stockings or hosiery on the legs to protect the nodules as well as the inner tissues. Over-the-counter and prescribed painkillers may help with any pain and discomfort. These may include the use of anti-inflammatories such as ibuprofen, aspirin, and diclofenac. With panniculitis caused by infections, antibiotics and steroids may be required for treatment. Nodules formed as a result of the immune system may be treated with steroid injections, immunosuppressants, or steroid creams. Although some medications may cause the formation of painful nodules, you should not reduce the dosage or stop taking it until the issue is discussed with a doctor. Sarcoidosis panniculitis usually dissipates over time without direct treatment. Using compression bandages and nonsteroidal anti-inflammatory medications may help with any discomfort. An alpha 1 deficiency may be treated with replacement or augmentation therapy. Healthy donations are used to increase the amount in the blood circulation to supplement the lack of alpha 1 antitrypsin. As a last resort or in extremely severe cases, surgical removal of the nodules may be required. This includes the removal of cells and tissue of lesions, as well as those in the necrosis or death state. Panniculitis is described as inflamed cells and connective tissue that lay near the surface of the skin. Small raised nodules are noted and may appear as a single painful bump or develop in clusters. The various types of panniculitis may be caused by infections, malfunctioning of the immune system, medications, or other health conditions. Once a diagnosis is confirmed, treatment can begin with a few natural remedies and medications, or may require surgical removal. “Panniculitis,” The Australasian College of Dermatologists; https://www.dermcoll.edu.au/atoz/panniculitis/, last accessed September 7, 2017. “Panniculitis,” Alpha-1 Foundation; https://www.alpha1.org/Newly-Diagnosed/Learning-about-Alpha-1/Panniculitis, last accessed September 7, 2017. “Alpha-1 Antitrypsin Deficiency,” Medline Plus; https://medlineplus.gov/alpha1antitrypsindeficiency.html, last accessed September 8, 2017. “Panniculitis, Idiopathic Nodular,” National Organization for Rare Disorders; https://rarediseases.org/rare-diseases/panniculitis-idiopathic-nodular/, last accessed September 8, 2017. “Panniculitis,” NHS UK; http://www.nhs.uk/conditions/panniculitis/Pages/Panniculitis.aspx, last accessed September 7, 2017. “What Is Panniculitis And How Is It Treated?” Healthline; http://www.healthline.com/health/skin-disorders/panniculitis#overview1, last accessed September 7, 2017. “Panniculitis (Mesenteric, Lupus, Septal, Cold) – Pictures, Definition and Treatment,” Prime Health Chanel, February 9, 2011; http://www.primehealthchannel.com/panniculitis-mesenteric-lupus-septal-cold-pictures-definition-and-treatment.html, last accessed September 7, 2017. Stanway, A., “Panniculitis,” DermNet New Zealand, February 2016; https://www.dermnetnz.org/topics/panniculitis/, last accessed September 8, 2017. Duffill, M., “Cytophagic histiocytic panniculitis,” DermNet New Zealand, 2008; https://www.dermnetnz.org/topics/cytophagic-histiocytic-panniculitis/, last accessed September 8, 2017. Ochoa, C.D., et al., “Panniculitis: another clinical expression of gout,” Rheumatology International journal, June 2011, 31(6): 831-835; https://www.ncbi.nlm.nih.gov/pubmed/20730459, (https://doi.org/10.1007/s00296-010-1561-8), last accessed September 8, 2017. “Panniculitis – Definition, Symptoms, Causes, Treatment, Pictures,” Healthh; http://healthh.com/panniculitis/, last accessed September 8, 2017. “Panniculitis,” eMedical Hub; http://emedicalhub.com/panniculitis/, last accessed September 8, 2017.